Old-fashioned Brownies with Walnuts are an ultimate comfort dessert, and I found a delightful recipe in a hundred-year-old cookbook. They were moist and chewy. 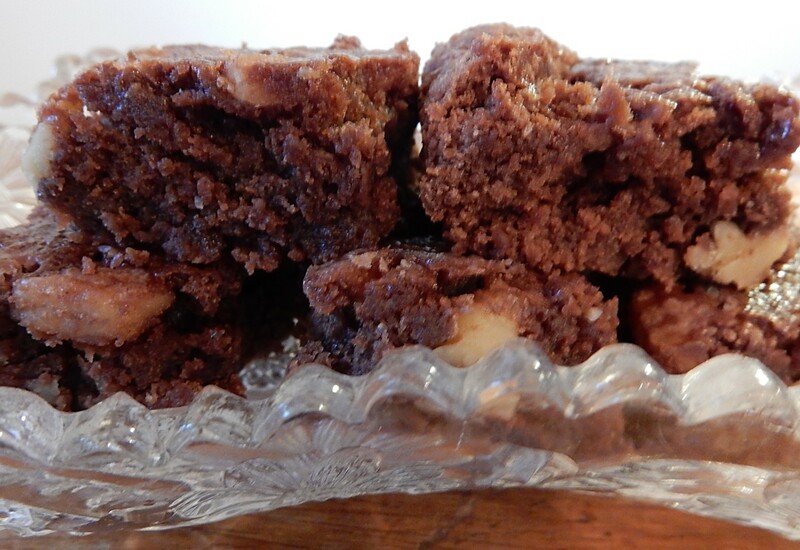 The top of the Brownies was less crusty than many modern brownies – but the Brownies were wonderful. And, my husband and I devoured the entire pan within 24 hours. This recipe was one of the signature recipes in the old cookbook. Of course Lowney’s Premium Chocolate is long gone, so I substituted unsweetened baking chocolate. I was also surprised that the recipe didn’t call for baking powder or baking soda – but the recipe turned out just fine without it. I baked the brownies at 350° F. and it took longer than 15 minutes for them bake. Preheat oven to 350 degrees. Cream butter in a mixing bowl; stir in sugar and chocolate. Add eggs, flour, and salt, and stir until combined. ; then stir in walnuts. Spread in greased 8-inch square pan. Bake for approximately 25 minutes or until an inserted toothpick comes out clean. Cut into 36 squares. Posted on September 19, 2016 September 24, 2016 by SherylPosted in Food, OtherTagged dessert, recipes. YUM! This recipe looks very similar to the one I usually use, from the Baker’s Chocolate box. There’s nothing better than a good brownie! It’s good to know Brownies have been around for such a long time. Looks like a tasty chocolate brownie. it’s always interesting to me to see the varied ingredients of the old recipes. I think maybe it probably made the brownies more moist by not having baking powder or baking soda. But it was only an 8″ pan. Where I come from, there might have been only 9 brownies in that pan! Size does matter! Now that the weather is getting cooler, those brownies look like the perfect snack. I didn’t realize brownies had been around for so long. One of my favorites especially when I add a scoop of vanilla ice cream to a warm brownie. Thanks for the recipe. Oh yum! It’s a good thing (for both of us) that I don’t live with you. I’d be three sizes larger if I got to eat all your good stuff. But keep it coming… a feast for the eyes and the imagination. Sounds and looks so good – I do love brownies! Since we went gluten-free I finally found a gluten-free brownie recipe which is very good. Until I found it we had to make do with a flourless chocolate torte to satisfy the endless craving for chocolate. 🙂 Brownies are definitely a comfort food and they never seem to go out of style. I’d have to double the recipe and bake in a 9″ x 13″ pan to get 36 brownies. Yummy! I would be tempted, but I made a dozen chocolate cupcakes with chocolate frosting today for our 6-year-old neighbor. I hid all but one before he came home. Oh yum. I need a non-gluten-free kitchen to try this! (hubby has celiac) They look so good! That is so good to know. Thank you! Oh boy does this sound like a 100 year old winner! Just in time for my transition from pecans to healthier walnuts. This looks very much like my old recipe. It doesn’t have baking powder, either. I might throw a big handful of chocolate chips in, too. Yum! Looks like a delicious recipe! These look so moist and delicious. They must have used a very high temperature to cook them in 10 to 15 minutes! Although now rereading it, it sounds like the batter was spread out on a cookie sheet and therefore not as tall/thick as today’s traditional brownies. Got to try this one! It looks easy. The brownies look delicious! I can see why you and your husband devoured them. This post reminds me that I’ve never made homemade brownies, have always used a box. So sad, I know. Sheryl, these are wonderful! I baked both the flour version and a gluten-free version (w/Wegman’s all-purpose gluten-free baking mix) and they both taste like “more” : ) My daughter is gluten sensitive, though not a celiac, just to be clear. The gluten-free version sinks in the middle slightly as usual w/GF baking. Wow, I’m impressed that you made this recipe two different ways. It’s great to hear that it turned out wonderfully both ways. Thank you for taking a moment to share your experiences with this recipe. People considering making one of the recipes on this blog find it really helpful when they can read how the recipe worked for others.